This is probably the smallest section of my Home Management Binder. If you can even call it a section, it’s more like the first two pages. However, I believe they deserve a post all to themselves. Now, there are many items that could be considered important information. For myself, important contact information is probably a better title. There seems to be a never-ending list of phone numbers we need to keep track of in our day-to-day lives. Phone numbers we don’t need often, but they’re important enough that we need to have them somewhere. Between smart phones and online address books, I don’t actually have a physical address book anymore. So, I decided to replace the scribbled on, lined sheet of loose leaf paper with a printable that is easier to read. I made up two different ones, one for Home Owners and one for Renters. As you can see, they’re pretty simple. I’m horrible with names, so I made sure to leave room to write in names, but a quick skim through the titles will get me to whatever number I need. There are two blank areas at the bottom of the right hand column so that you can include numbers I didn’t think of. The next printable is just a replication of something I did by hand. I’ve had this at the front of my HMB ever since I made my first one. No-one likes to think about emergency situations, but it is something that needs to be thought of. There are numbers that you might need in a hurry and having to look them up or dial 411 costs precious minutes. So, I put them all together in one spot. Now, the first thing you might have noticed is that there is a LOT of white space on this one. I did that on purpose. I’m not filling this one out with a pen in my normal writing. I’m filling this one out with a black, easy to read, fine point Sharpie. I’m going to print large, and clear, and make it as easy to read as possible. I want it to be so easy to read that my five year-old can use it if need be! As a Mom, I hope that if there is an emergency at home that I am able to deal with it, however, there is no guarantee. 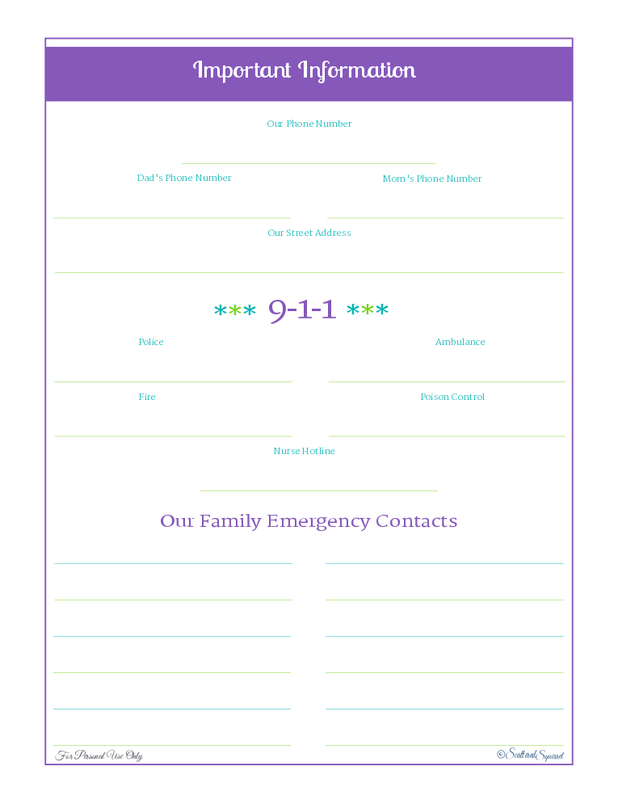 With this printable I can make sure that my kids, or a babysitter, or visiting relative have all the information they might need in case of an emergency. 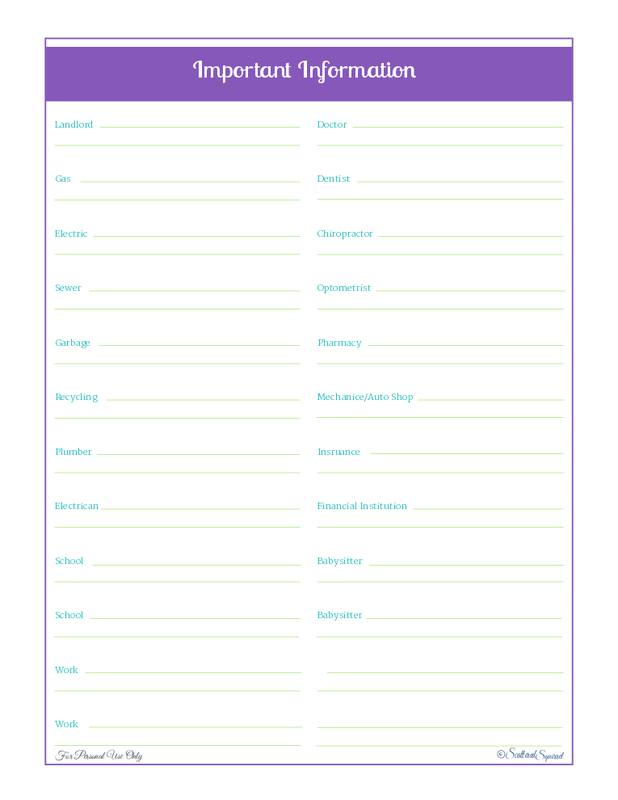 Things that might be hard to think of in times of stress, such as our street address, mom or dad’s cell numbers etc… I also included a space for numbers that are good to have for non emergency situations. A situation that isn’t dire enough for 9-1-1, but still might require assistance. And finally, a space for a list of family and friends to call in case of emergency. Again, because you just don’t know what could happen. I’ve printed out two copies of these printables. I filled them out and popped them into sheet protectors with the emergency one facing out. One went into the front of my HMB and the other is on the fridge. Easy to see, easy to get to. (If you want to grab a copy for yourself, just click on the pictures!) The paranoid Mommy in me wants to put them all over the house, one in every room and at every possible exit, but that might just be over kill. Sometimes, managing your home means thinking of what ifs. It’s not a pleasant thing to think about, but I feel a little better knowing that this info is there in case it is ever needed. What about you? Do you ever think about the what ifs? Do you have plans or strategies for dealing with a possible emergency?